I really hate to admit this, but all of my 2009 and 2010 lessons sit on two separate network drives at school. They are neatly organized by unit and easily accessible from our network drives. When 2011 starts, I could theoretically choose what I want to carry over from the previous year and copy into a new folder. At the end of this school year I finally decided to abandon this antiquated system. There are two main reasons I starting thinking about a change. First, in order for me to compare what I did in 2009 with 2010, I actually have to open up both documents in new windows. Then I have to move from window to window to catch the differences. Another struggle with this system is that it makes it harder for me to reflect on changes. My reflections a) usually come at night and b) are fleeting. In all honesty, sometimes the extra 3-5 minutes it takes to load up Citrix and access the network is just enough of a barrier to prevent me from going back into my lesson and adding my reflection. Both of these problems led me to a decision: I will move my lesson planning into the cloud. 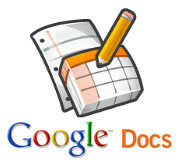 For 2011, I am going to use Google Docs to plan lessons, write lecture notes, and store materials. I believe that Google Docs will allow me to take care of both of the aforementioned problems. First, I can simply overwrite my lessons year after year (or day after day), keeping them in one file, yet always having the ability to revert to something I did years ago. Additionally, I can use this same “see revision history” function to review changed made year-to-year or comments added after I implemented a lesson. Even better, I will have access to my lessons at my fingertips. I am always logged into Gmail (at school, home, mobile), making my work much more accessible than through good ole Citrix. There are a few drawbacks to this approach. The first of which is collaboration. Yes, it is easy to collaborate on Google Docs, but most of my colleagues are much more comfortable reviewing documents through the network drive and Microsoft Word. That said, it might be easier to share documents with substitutes, who do not have access/knowledge to get in and out of our shared folders. In addition, for both substitutes and colleagues, Google solved the problem of not having a Google account with its recent sharing updates. Another drawback is the fact that I am without my content if the internet goes down. With everything in the cloud, if there is an internet outage, I would not be able to access my content. That said, this also could happen (and does) with our network drives. Third, I am beholden to Google as a safe repository of my work. If the company goes rogue, I am in deep trouble if I have not been backing up my items regularly. These changes are important to me because I believe one principle of great teaching is lesson reflection and improvement. Ideally, some reflection occurs within 24 hours of a lesson and then again at the end of a unit. During class, unintended teaching opportunities arise that we hadn’t anticipated. Capturing these insights is much more likely with reflection. In reflecting, we can take advantage of those unintended opportunities that arose during class. By reviewing a lesson after a summative assessment, we have more perspective on how our formative work helped/hindered objective mastery. Unfortunately, this is a time-consuming task and often gets pushed to the bottom of our to do list as it is important, but it is not urgent. I think moving my lessons to the cloud will not make time for reflection suddenly appear, but it may eliminate some of the barriers making it harder to do.